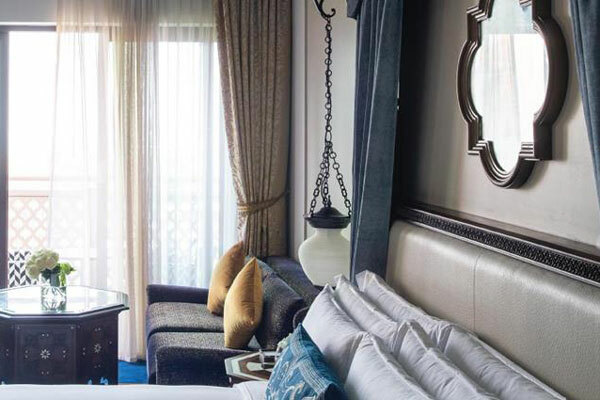 Jumeirah Al Qasr - known for its palatial grandeur in the heart of Madinat Jumeirah in Dubai, has refurbished its full inventory of rooms and suites, maintaining its traditional Arabic style, but now with a contemporary flair. All 294 rooms (complete with terraces and balconies), have been refurbished to offer a rich and yet modern Arabic experience. Navy, orange and blue tone patterns captivate the eye, resulting in an elevated design that pays homage to opulent and modern Arabic design, designed by Khuan Chew of KCA International Interior Design. As well as the variety of rooms (spread across nine room categories ranging in size from 55-sq-m to 115-sq-m), the Royal Suite (three bedroom) and Presidential Suites (two bedroom) have also been fully renovated with changes being made to the dining area of the Royal Suite, as well as arabesque ceiling joists and mosaics added into the flooring. This further complements the new feature wall in the Presidential Suite, adding a contemporary flair to the traditional Middle Eastern design the hotel is famed for. With the completion of the refurbishment, the new rooms continue to complement the world famous design elements of the 18 golden horses that lead to the hotel entrance and the captivating lobby presided by a five ton crystal chandelier, resulting in a truly regal experience, dazzling guests at every turn. Evoking majestic images of the tales of One Thousand and One Nights, Jumeirah Al Qasr is the epitome of grandiose luxury. Famed for its iconic waterways that flow through 2km throughout the resort, and located on one of the world’s most recognisable shorelines with views of the iconic Burj Al Arab, it is a hotel that sits in a majestic realm of its own. Guests staying in the hotel still have the privilege of enjoying the 2km of pristine private beach and the largest acclimatised swimming pool in Dubai, surrounded by forty hectares of gardens, restaurants and pool bars. To relax and unwind, a visit to the award winning Talise Spa for rejuvenating treatments is always a must, and for those visiting with families, unlimited access and proximity to Wild Wadi Waterpark continues to thrill. In addition, the hotel is home to a number of outstanding restaurants including The Hide and Khaymat Al Bahar, both offering a wonderful gastronomic experience within an unparalleled destination.